With the memory of the holidays disappearing into a snack and booze filled haze, you may have woken up wondering “why does the only thing that fits me have an elastic waistband?”, “where did all my exuberance go?”, and “how the hell to do I get rid of this cough and stuffy nose I’ve had for the last two weeks? Well friend! Fear not; there are tons of super simple steps you can take to help regain the pep in your step, the regular belt loop on your pants, and a clear breathing pathway. 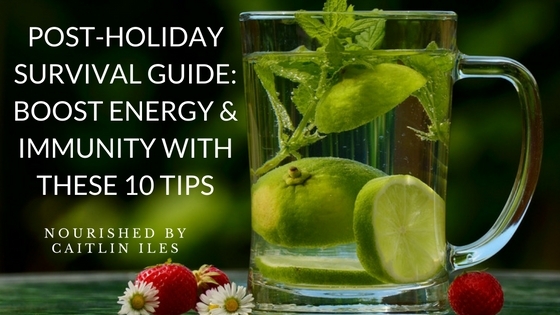 Check out the 10 best post-holiday survival guide tips below! If you’ve been following me for any length of time you know how obsessed I am with all things fermented. And with good reason! New research is coming out that shows just how important a robust microbiome (the fancy pants way of describing the community of symbiotic bacteria in you gut) is in terms of regulating mood, appetite, nutrient status, and immune function. Luckily it’s never been easier or cheaper to get the fermented foods you need to seed your digestive tract and bring your immune function back up to 100! Try whipping up a batch of sauerkraut, sipping on some switchel, enjoying some pickled kale stems (they’re weirdly delicious! ), or relaxing with a glass of kombucha. I know this one isn’t going to make me many friends, but I’m not saying you have to avoid dairy forever, just that it can be a great way to help relieve chronic congestion and potentially even clear up some of those post holiday breakouts. I suggest going dairy free for 2 weeks to give your immune system and sinus cavities a boost. Try swapping out the milk in your coffee for coconut, cashew, or almond milk. I don’t know about you, but over the holidays I stayed up later than normal. I’m usually a night owl anyway, but what with the time change and my love of the quiet after everyone goes to bed, not to mention a few rowdy nights out, my sleep wasn’t quite up to par. Without adequate sleep your immune function can suffer; you can get cravings for crappy, sugar-laden junk food; and you just likely feel grumpy and out of sorts. I’m giving you permission to sleep in later on the weekends, nap if you need to, and go to bed at a ridiculously early hour if that’s what your body is asking for. Take a beat to check in with your level of tiredness and listen when your body says sleep. Your Netflix shows will be there in the morning. While I managed to stick with my non-negotiables this holiday season and avoid dairy and grains, that sneaky little bugger, sugar, snuck it’s way back into my life in a big way. Being on a blood sugar roller coaster not only impacts your energy levels, but suppresses immune function, leaving you more susceptible to the office colds and flus. I recommend a one-week sugar detox to reset your palate and give your immune system a break. Take your hydration game to the next level by sipping on herbal teas. The holidays can be full of alcohol and treats that can put a burden on your digestive and liver function. Tea is a great way to get some antioxidants and nutrients that can help soothe your body. I’ve written a big post about some of my favourite teas for digestive aid and the best teas specifically for liver detoxification. Aim for 3 cups of herbal tea a day to give your body and liver a little love. Often the last thing you want to do after the holidays is get your booty back to the gym for high intensity training and if your already feeling run down and sick it can actually be counterproductive. However, low-impact movement that activates your muscles, such as walking, can help move stagnant lymph fluid from your extremities. Your lymph system is one of the key players in healthy immune function, but unlike the circulatory system it needs some help moving lymph from point A to point B. The activation of your muscles helps squeeze the lymph fluid up and out of your extremities so that your body can process any pathogens. You can also try dry brushing to move it along. Not only does walking help support lymphatic function, it’s a great way to calm your brain after the hectic holiday season, especially if you can do it surrounded by trees. I’ve written a post all about why I love broth right here, but to summarize there are certain components to homemade broth that actually help ward off upper respiratory tract infections. Plus the gelatin can help give your skin a boost if it’s feeling a little less vibrant from all the funtivities. As I mentioned above, your liver may have taken quite a beating over the last month and by eating liver-supportive foods and drinking specific liver-loving teas you can help it get back to normal. Avoiding alcohol and anything that contains high fructose corn syrup (think sodas and pretty much anything from a package) for one to two weeks can remove some of the burden of detoxification as well. You’ve likely had a ridiculous amount of parties, events, and get togethers to attend or host over the last month, which can leave you feeling tired and overwhelmed if you’re an introvert. This level of exhaustion can negatively affect your energy and immune function if you don’t give yourself time to rest and rejuvenate. If that’s the case, allow yourself to say no to engagements this month in favour of the things that bring you calm and joy. It doesn’t matter what that looks like, but if you find yourself saying “yes” to things that you dread, try testing out how it feels to say no. And remember: No is a complete sentence. You don’t have to justify your response beyond that if you don’t want to. Perhaps most important of all on this list is listening to your body. It’s incredible what kind of wisdom you can find inside if you just slow down for a few breaths and pay attention to what your body is trying to tell you. She will often know exactly what you need to do to bring yourself back into balance after the holiday season. That might be 10 hours of sleep a night, hermitting yourself away for a couple of weeks, or eating an entire bag of clementines in three days. Just listen to what your body has to say and honour it. Now with this is a wee caveat: I think you know what signals your body sends you will support health and which will support dis-ease. Basically sloth time. It’s the perfect way to stretch out tense muscles and reconnect with your body and breath. You can read all about why I love restorative yoga right here. Well those are some of my favourite ways to bring my body back into balance after the fun of the holidays. And remember, if you need any extra support to help start 2019 feeling strong and healthy, make sure you download my FREE Anti-Inflammatory Meal Plan & Shopping List right here! As always, thanks for your love and support!